Ledaig is the name of the peated whisky produced at the Tobermory distillery on Mull–the unpeated is sold under the Tobermory name. The distillery was originally founded as Ledaig, however, and I’m not sure when Tobermory became the official name. I don’t have a whole lot of experience with the whisky, of either type, made at this distillery. There has not been a whole lot of it available in the US and what has been has not always had the strongest reputation. This has especially been true of contemporary Ledaig. 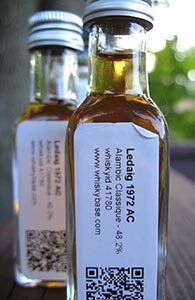 However, I’ve recently had some young indie Ledaigs that were quite nice and so when I saw samples of this far more ancient (from an earlier era, and very old) Ledaig were available I could not resist. The bottler is Alambic Classique, another German bottler with a good reputation. Nose: Oh my. Rich, earthy peat; no smoke as such. Then deep caramel and a big hit of dark fruit: concentrated raisins, apricots, plum jam, tangerine peel. The next wave is from the ocean: kelp, salt. And then the farmy peat returns with some dry smoke. There’s no hint of wood on the nose, which is quite remarkable for a 40 year old whisky. With more time there’s leather (an old armchair in a dusty library), balsamic reduction, dark soy sauce. And with even more time it gets quite fruity again. One drop of water brightens the fruit up a little at first and then makes it fermented and tropical. Really quite lovely. Palate: Soft mouthfeel. Leathery peat and plum syrup, followed by some salt. Smoke builds in the background but is not too heavy. Remarkably, there’s no wood here either. It’s not just that it’s remarkably un-woody for a 40 year old whisky, it’s that this is not woody at all. How does that happen? On the second sip fruit takes precedence: citrus now along with the plums. And there’s more dry and salty smoke now–and there’s that aged balsamic from the nose. Water pulls the fruit out to the front and pushes the peat to the back: dried tangerine peel soaked in old balsamic. Finish: Medium. Caramel and raisins, and earthy smoke on the edges of my tongue. Not a tremendous development here with or without water. Comments: Just lovely. The nose is really quite amazing. The palate is very good too but not quite as otherworldly as the nose. And, as is not unusual with very old whiskies, the finish is least intense. None of this is meant as a criticism. Whisky this good should not be quibbled over. Alas, it’s sold out and so I can’t make a ruinous decision (yay?). So very glad I got to try it though, and I might look to see if I can get a couple more samples of it. This entry was posted in -Whisky by Rating, 90-94 points, Alambic Classique, Ledaig, Tobermory. Bookmark the permalink. Mammoth. Just fantastic tasting notes. Thanks. As I noted on Twitter, I don’t have a whole lot of experience with whisky of this age or from this era. I’d be interested to see if those who’ve had far more of them might be less enthused. Though, I was just asked by a friend why I didn’t give it more than 91 points. My explanation is both specific and abstract: 1) the palate is not at the level of the nose and 2) I would like to believe that at least 9 points separate this and perfection. Call me an optimist. I know this is very weak-minded of me, but I am very pleased to note that Serge got around to reviewing this whisky today (scroll to the bottom) and found very similar notes and gave it the same score. Hi, just found your review. I really liked it – and I love the whisky. I’m happy to report that my Sample was/is al bil larger than yours. 700ml to be precise. Glad you recognized your experience in my review. I couldn’t find a bottle after all, but did manage to get my handle on two more samples–so I do have a small treat saved for a special occasion. And it’s probably not worth quibbling over the difference between 91 and 93 points; I’m sure that if I drank this at a different stage in this bottle’s life I might well have been higher.